Software is never quite done. Even if you have all the features put in, and all the known bugs fixed, if you stand still, the world will slowly pass you by and leave you behind. A modern app is, more or less, expected to be everywhere. People expect seamless sync between all their devices, intelligent offline, presence of all the screens in their life, and constant adaptation of how the app behaves to the ever-evolving world of technology that we live in. The same goes for web sites. Space Jam is a rather wonderful memento of the early web frozen in time. But it’s a curiosity, a rare peek into the world of yesteryear. Content is king they say. Whoever they are, they don’t tell you that the presentation of content matters. As I was switching my site to be fully HTTPS earlier in the year, I was reminiscing on all the non-content maintenance work that I keep on doing on a semi-regular basis with my site to keep up with the latest and greatest. To keep up with what is “expected” of modern web sites. To get a feel of the burden the technology evolution is placing on hundreds of thousands (millions, tens of millions?) of web developers that find their carefully constructed houses of cards gather cobwebs. In 2012 I’ve switched to using web fonts, and I kept on tweaking those ever since – for body, headings and navigational elements. In 2013 I’ve switched to fully responsive design, scaling the overall layout to behave well on a variety of screen sizes. In 2014 I’ve switched to use 2x / retina images on relevant hardware, which required going back to the archives and resourcing all the images in the interviews that have been published until then. In 2015 I’ve switched to a single-column layout, rearranging the content to flow better across a variety of screens. In 2018 I’ve switched to HTTPS, even though the only user-facing input box is the search tucked at the very end of the page. 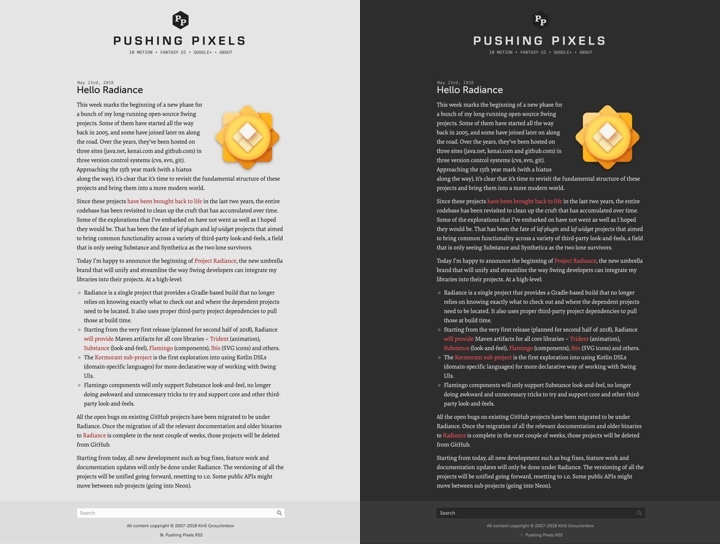 On the left is the regular version of Pushing Pixels. On the right is how it looks like running under Safari Technology Preview on the latest macOS 10.14.1 (Mojave), with the work under way to add the matching CSS selector support to Firefox and Chrome. I hope this little web garden of mine will be there in 10 years. In 20 years. Hopefully in 40 years. There’s a lot of tending ahead.